Charbax has turned up another neat little gadget at IFA. He stopped by the E-ink booth and got Sriram Peruvemba to demonstrate E-ink's latest product. 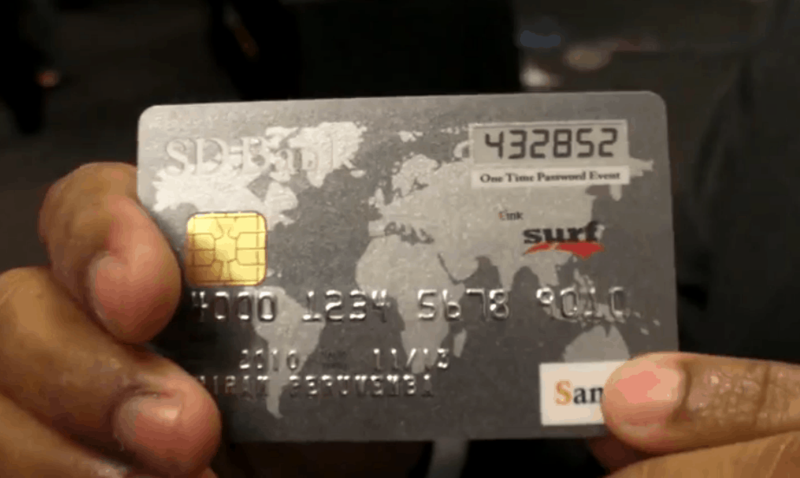 It's a complete battery+screen+chip solution that can be embedded in a standard credit card. It runs on a battery that should last 2 years, and is shipping right now. It's designed to generate a 1-use key each time you use it. There's a number of existing security tools like this now (Paypal have one), and the idea is that the single use PIN reduces the risk that someone might memorize the security info when they copy your card. The difference between E-ink's solution and the other products is that the others are all a separate object. Paypal, for example, mounted theirs on a keychain (it's about the size of a small flash drive). E-ink's solution removes the need to carry around a second object. Right now it's mainly used in banking and other high security industries, but there's no reason why it can't be used as a credit card. With all of the security breaches credit card firms have suffered in recent years, you’d think they would jump at this. As a consumer, I’d certainly like it. I knew I’d read about it already. E-Ink actually announced it on their website a couple of months ago, on 29 June last. Maybe I am wrong but wouldn’t it be more dangerous than a card with standard PIN? When somebody steals that new type of card he will get a card and valid PINs set as well. It’s like having PIN written on a card.